The official Digg app is out for your iPhone and iPod touch, and if you are a devoted Digg fan you are probably pretty excited to have this app on your iPhone. I must start by saying, given it has taken Digg over 2 years to release their iPhone app, I expected a lot going into it. On the Digg app homepage, you’ll notice a simple list of stories with their title and the classic digg counter. From here you filter stories by Top, Recent, and Upcoming, and your saved stories. Narrow down the list of stories to sub-category by tapping the Topics icon, where you’ll see a list of the 2nd level topics such as Technology, Sports, Offbeat and more. To get to the 3rd level deep categories such as Technology/Apple or Offbeat/Comedy is a little tricky to figure out. You have to tap on the blue colored arrow icon instead of on the title to get to them. The blue icon can also be tapped in the list view to slide down a summary of the story and its metadata. Your dugg stories have a green border to indicate them as such, while your buried stories have a red border in the list view. There is a search option as well when you’re in a list view that lets you find stuff by keyword in either Best, Recent, or Diggs. In the story detail page you see an icon on the top right to indicate the number of comments, and a bar on the bottom lets you digg, bury, share, and save stuff easily. To refresh the list of stories, pull up on any category list and you’ll see a “Refresh” text that you’ll have to tap. It would have been better if this was automated like Tweetie works. Tapping the comments button takes you to the comments tab where you can view Top comments, All comments and see related stories. You can digg or burry comments. Settings are pretty limited in the Digg app. You can basically save your Digg account login info, and add Twitter and Facebook login credentials as well. The look and feel is great and it’s a free app, so we can’t complain too much, but here are some. There is no push notification support in the Digg app. We also can’t find any way to narrow down stories by Images, Videos or News, so it looks like you just get PIC posts inline with other stuff in the app. The login experience is not streamlined and looks very “webapp” like. 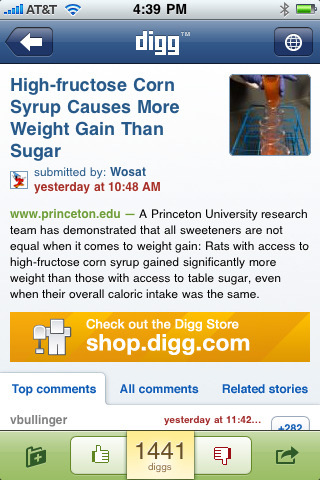 Finally, and this is a big issue, you can’t post new stories nor write comments from this Official Digg iPhone app, which basically makes it a glorified web browser. We expected a lot more from Digg and hope to see them release updates to add new features. AppSafari review of Digg iPhone app (official) was written by Joe Seifi on March 25th, 2010 and categorized under App Store, News, Reading. Page viewed 4000 times, 1 so far today. Need help on using these apps? Please read the Help Page.